There's nothing like lasagna to soothe a craving for a creamy, dreamy meal. 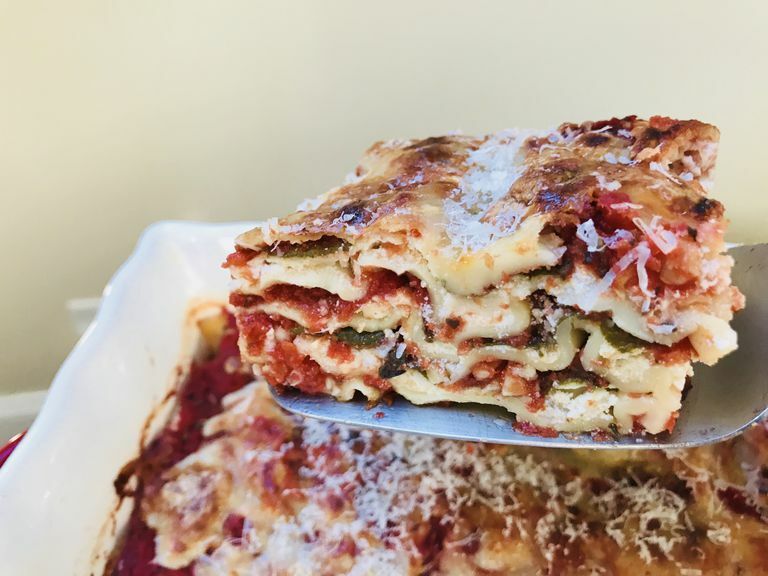 With a foundation of vitamin C-rich tomato sauce, which is loaded with the carotenoid lycopene, this Italian classic takes on a healthy bend with a good dose veggies nestled in its layers. Preheat the oven the 350F. On the stovetop over medium heat, pour the tomato sauce into a saucepan. Add salt, oregano, and garlic. Bring to a light boil, lower the heat, and simmer for a few minutes. Stir occasionally. On the bottom of a 9x13 pan put a layer of tomato sauce. Place a layer of noodles on top, covering the bottom of the pan. Spread ricotta cheese on top of the noodles, top with spinach, and sprinkle with mozzarella cheese and coat with a small ladle full of sauce. Repeat the layers until you get to the top of the pan. Sprinkle the final layer with mozzarella cheese. Place in the oven and bake for 45 minutes or until bubbly and cheese is golden brown on top. Remove from the oven and allow to cool for a 10 minutes before serving. Make this dish higher in fiber with whole wheat noodles, although they may only be available in the boil variety. Add other vegetables such a sliced carrots, zucchini, or eggplant. For an alternative green, use baby kale or arugula. Spread pesto between the layers or incorporate it into the tomato sauce for a rich, nutty flavor. If you want to add meat, add cooked, diced chicken breast or ground turkey to the sauce. For a non-dairy twist, use vegan cheese in lieu of ricotta and mozzarella cheese. To save time use no-boil lasagna noodles—they're quick and easy to assemble. Plus, the part-skim ricotta cheese and mozzarella reduce the fat but still offer good-quality protein. This dish can be assembled and placed, uncooked and covered, in the refrigerator overnight. Simply heat and serve the next day. Leftovers can be stored in the refrigerator or freezer in an airtight container.